We produce a range of in-house subject-specific bulletins to ensure our clinical and professional teams stay on top of developments in their work areas. You can see our growing range of bulletins below. 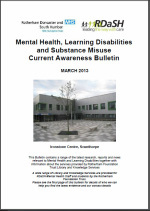 Click on an image to view the current and previous issues of each bulletin. To request a new bulletin for yourself or your team please contact us with details of your requirements and we can create the bulletin you need. In addition to our own bulletins please scroll down for our list of recommended national healthcare bulletins and current awareness services. Subject-specific bulletins can also be found in our Speciality Portals.